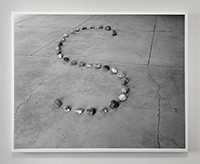 In these cryptic black-and-white photographs, words are spelled out with stones on the floor of a sunlit warehouse. (The exception is one lonesome “S.”) The series was staged, in 2016, in an unfinished space designed by Donald Judd, in Marfa, Texas. Moving around the gallery, reading the pictures, one longs for a coherent message, but good luck parsing the phrase “s-end-for-the-me-their.” A suspicion emerges: disorientation may be Hubbard’s point. In the photograph “Their,” she achieves a remarkable trick, as a swath of bright desert, glimpsed through a missing concrete panel, offsets the word, seemingly defying the optical laws of vanishing-point perspective.